After being selected in today’s game against Stockport County, Tigers’ captain Josh Brizell has now made his 150th appearance for the club. 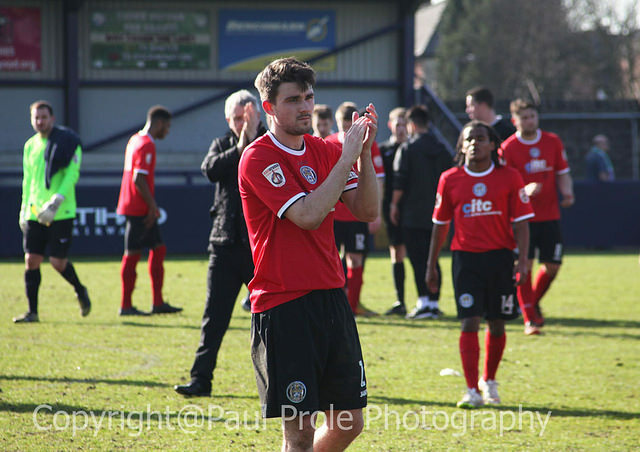 Josh arrived from Rochdale in October 2011 appearing as an unused substitute at Harrogate Town but didn’t make his debut until November, coming on at half time against Hinckley United to replace Joel Richardson. He went on to become a regular starter in the championship winning side, making 23 appearances in total. He was an integral part of the side that survived the first season in the Conference Premier making 43 appearances and scored his first goal for the club, a late winner against Cambridge United. Last season he started 40 games as Hyde were relegated from the Conference Premier and was sent off on three occasions. Today’s appearance is his 44th of the season, the most he has made in any single season, and he has also scored six times in this campaign, taking his total for the club to nine. He has been sent off four times in total (none this season), which is a joint club record in the database which goes back to 1979. He shares this with Adam Griffin and Paul Taylor who got their four in less games. In terms of total appearances, he is now 33rd in the database (again back to 1979) with 150 which puts him just above Billy Garton and Val Owen (149) and just behind Peter Coyne (155). Congratulations Josh, here’s to the next milestone!